So why are we using the shipping label? so flimsy. It will jam in the printer for sure. to get the fabric through the printer. Forget the spay glue adhesive and freezer paper. This is much better. 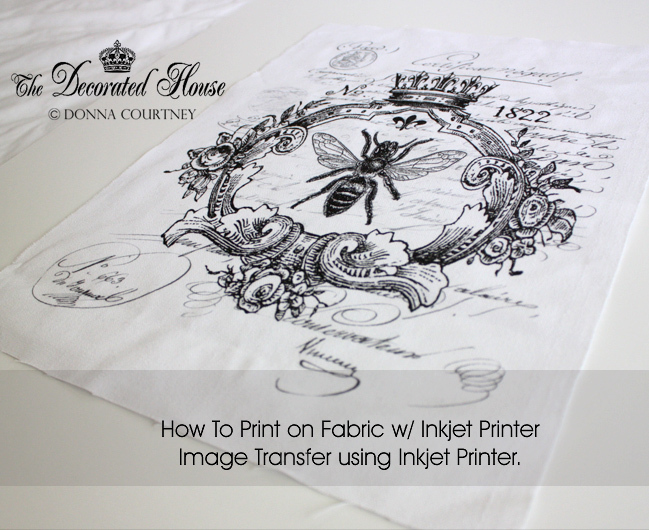 It is very easy to do and requires no messy chemicals to transfer your image to fabric. This tutorial will show you how to use your inkjet printer at home. 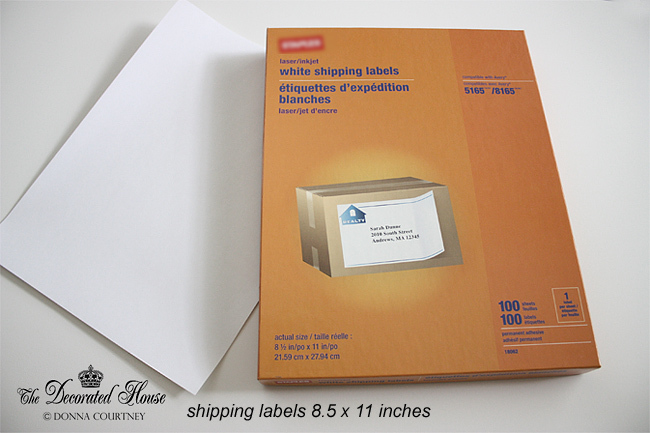 The secret to making this technique so simple is the use of large shipping labels. They come in 8.5 x 11 inches sheets with adhesive on the back. and some other stores as well. but you can find smaller boxes too. Choose your fabric. This should be something like a cotton or cotton blend. The fabric here is a medium weight unbleached cotton. The first picture above is a white linen. 8.5 x 11 label leaving a 1 to 1.5 inch area around the entire piece. to take the backing off the sticky label. on the BACK of the fabric. 3. 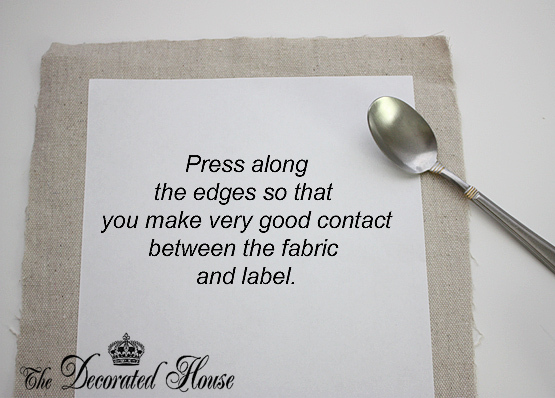 Press firmly along the edge of the label. between the fabric and the label as possible. A spoon works fine if you don't have anything else to use. 4. Next cut the fabric around the label. 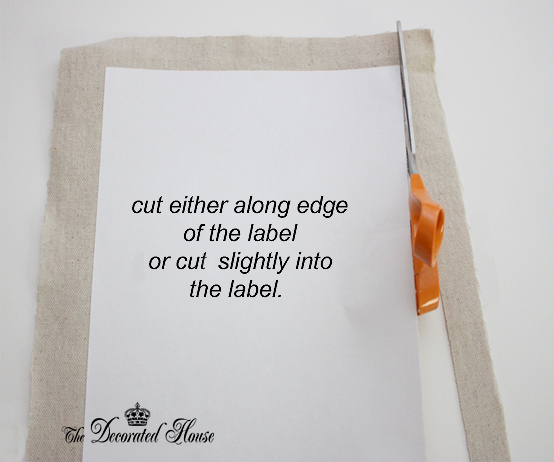 Cut as close to the label as you can. Cut slightly into the label. This will give you an even better seal. cut into the label slightly. so that the fabric side will be printed on! if you can't remember, test on plain paper first. Guide the fabric in as it begins to print. can iron your fabric after it is printed. remove the label from the back. after you print your fabric. printed on an Epson printer, 8.5 x 11 inches. 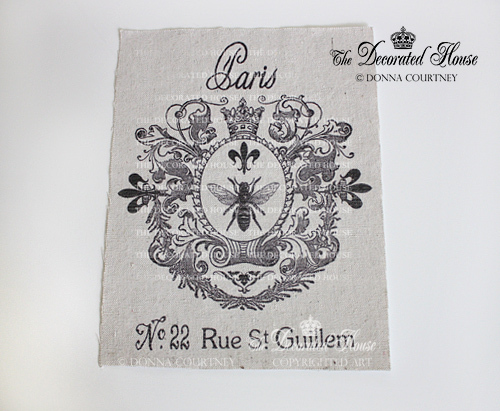 Both of the smaller art fabrics are 8.5 x 11 inches using one full label sheet. They are both on unbleached cotton of slightly different weights and colors. The larger one, in the center, is using TWO labels. It is printed on white cotton linen. and was printed on a large format Epson printer. by using more than one label. want your final fabric piece. making sure to keep it straight. *Disclaimer: About Printers: Although I have used my large format printer which is a little bit more expensive printer to do this, there is a chance that if you use your printer with certain fabrics it may cause harm if any threads come off inside of it. 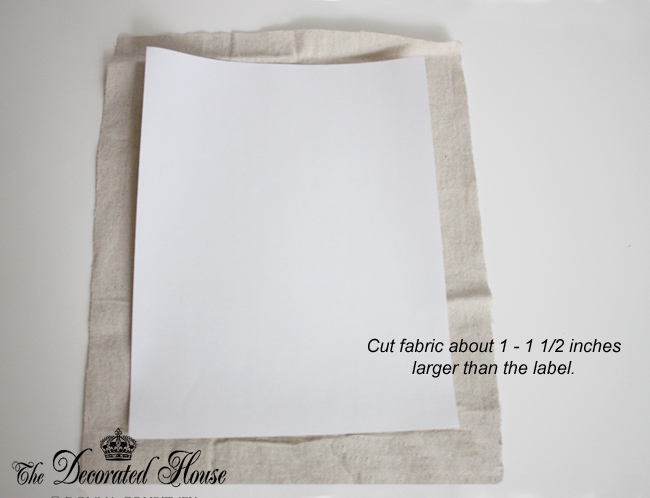 If your printer can print on fabric transfer paper, then it should print using this method. Just be sure to trim off any loose ends/threads before inserting the fabric into the printer. that you can think up to create! Very nice! I've printed on fabric before, but using a shipping label is so smart. I've used that awful spray glue that gets everywhere. Great graphics! I am going to try this, Donna! I do have these shipping labels already on hand and some Osnaberg fabric that will probably work. I'll let you know how it turns out! : ) Thanks for the tutorial! Great tutorial Donna! Thanx for sharing. What do you suggest putting on the fabric so that the ink won't run if it happens to get wet? Yes, this is so much better than the spray glue Pam. You will love this method. Kathy, since you have the paper, some art, and the fabric, I know you will be doing this very soon! Be sure to let me know so I can see it too. Pam, if I were really concerned about moisture for where this fabric would be used, I'd first try to use a printer like my Espon that the inks are more moisture resistant. Also, you could use a matte gel medium over the design. Just be sure to test the inks from YOUR printer to see if they will bleed. Most won't but the testing will let you know for sure. I love this idea! I'm going to give it a try to create some labels to put on totes that I make. Many thanks for sharing such a great idea & awesome tutorial! Adding this to my plans this weekend! Blessings! Donna, I can't thank you enough for sharing this! I don't have a laser printer and haven't figured out an easy way, without that glue stuff. I will be trying this! Thanks for the tips! I love this project and already have an idea in mind. I have always wondered how others print directly on the fabric. I have used iron on transfer sheets in the past and wished I could learn how to print right on the fabric. I am bookmarking this post for future reference. Thanks so much for this tutorial. Love it. 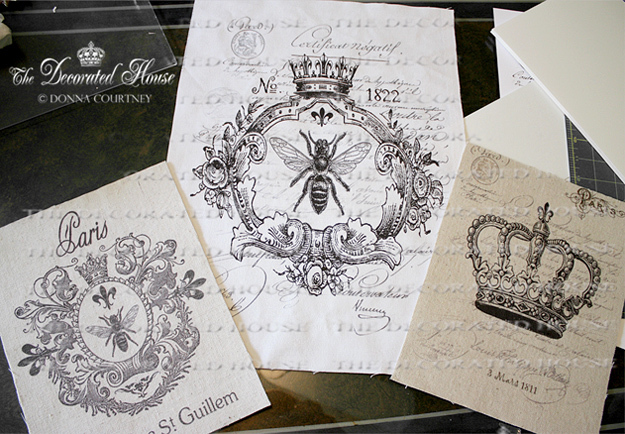 Can you tell us where you got the bee images. Was it Graphic Fairy? I know you will be so happy when you see how easy this method is! And the image is as good as your printer. No worry about part of it transferring and some of it not working. Diane, the bee art shown here was created by me. But someone sent me a note saying that Karen does have some bee graphics on her site that they were going to use for trying out this technique. It would be a fun place to start looking. This is so great! Love how easy it is. I only have a laser printer. Ever tried that? Brilliant! Thank you Donna! Must try! Nancy this will work on a laser printer as well. I only stated an inkjet because other transfer methods require a laser printer and will not work with the inkjet. You will get a great image with your laser. Hi Monica~ I know you will be creating something fabulous when you try this! Thanks again for coming by everyone! Great idea! I've used the sticky back paper from something, not sure if it was labels but I think it may have been fabric sold for printers. Can't find it again so I'm going to try this. just found your blog....Very Nice. New follower. I tried it, wonderful, thank you so much!! I was just browsing your blog and came across this post. Love this idea! I am in the middle of redesigning my master bedroom and have been looking for an easy way to transfer images to fabric so I can make custom pillows. I am also going to try this method for some pillows for my shop. I have some great old beachy images. 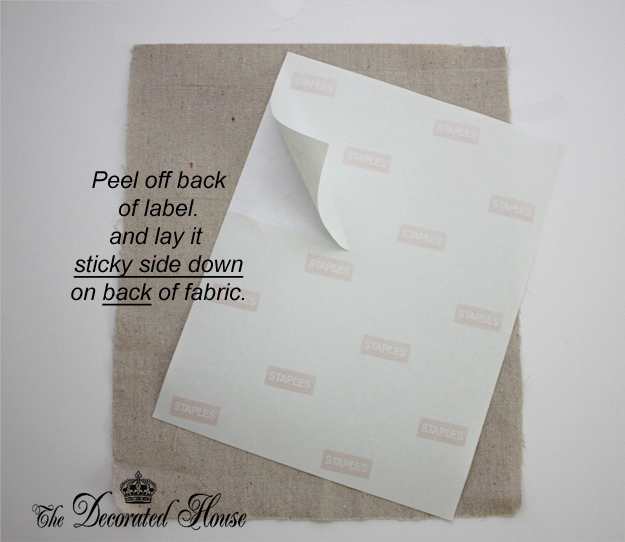 Maybe this would this work on adhesive contact paper instead of the labels? I have a bunch of that already on hand. Might try this first. I have done this many times before even with color ink but instead of buying the labels, just spray a paper with spray adhesive and stick the fabric to it. Works the same way. Thanks for such a good tutorial. Yes, I've used the spray adhesive many times. I have to say I love the labels because they are less messy. But in a pinch, I'd spray away. This is a great idea! I kind of want to try a mixed-media image that's first printed and then partly embroidered over. What have you done with the ones you've made? Some of my friends over at Kollabora, the crafting and DIY community, spend a lot of time looking for new ways to put images on fabric. One of them has a vast collection of T-shirts he's stenciled. I think they'd love it if you posted a picture of one of these projects on the site! Donna--you saved the day! I handprinted on fabric a "dedication" for the back of a quilted wall hanging I made but it looked so amateurish compared to the rest of the quilt. I thought of computer printing on fabric but didn't have time to have it done or order special paper. I came upon your tutorial and it worked perfectly. Thank you so much for sharing. I do have one question, though...you mention in one of your comments that this process will work on laser printers also. Don't they get too hot for the fabric? I was afraid to try it. I am so happy to hear that you tried this and how well it came out for you. I love how wonderful the image is, just like a printed piece. Since I have not used a laser for this method, I changed the wording to say that. But I have read a few times that people have put fabric in their laser printers as well. Thanks for taking the time to leave your note. I love knowing that the posts are helpful to others! Hello Wendy, Look at the pictures in the post and at the 4th picture down, which is step #2, you will see that you take the sticky backing off the paper so you can adhere it to the fabric before you print on it. Thanks Donna, I was getting confused over after the printing whether the paper is left on, but you mention after ironing it you remove the paper (step 6), its a brilliant way of printing on fabric.